Bergenias are perennial, semi-evergreen plants which originated in central Asia. 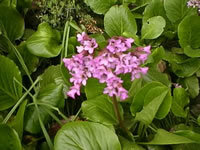 The Bergenia has been cultivated in home gardens since the early part of the nineteenth century. In the past hundred years or so botanists have created many new hybrid cultivars of this plant. Unfortunately, this very worthwhile plant seems to be overlooked by many gardeners as they make their garden plans. The large, leathery leaves of the Bergenia plant resemble a heart, with saw-toothed or wavy edges. For most of the year these leaves will remain a glossy green, but in colder climates the foliage will take on a beautiful red or bronze coloring in the fall. The small, bell-shaped flowers are produced in compact clusters atop twelve inch burgundy stems in the early spring. Bergenia flower colors range from the palest pinks (almost white) to ruby red or dark purple. Each flower spike usually only lasts for a few weeks, but the blooming period can be prolonged by removing the spent spikes regularly. Even when they are not in bloom, Bergenias are beautiful. Bergenias will grow from 1 to 2 feet high and spread 20 to 24 inches across. They are excellent as ground cover, rock garden or border plants. Bergenias are easy to propagate and to grow, and they will tolerate a wide range of conditions. Bergenias are hardy in USDA Zones 4-10. They can be planted either in the spring or early fall. 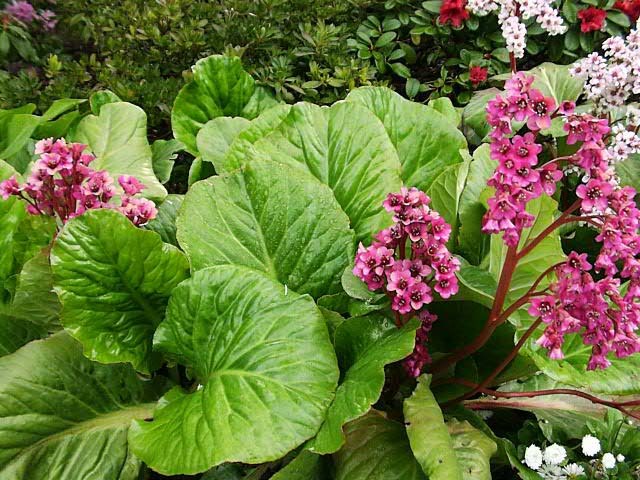 Bergenia Plants will tolerate a wide range of lighting, soil and moisture conditions, however the optimum conditions for these plants are sun, (light shading from hot sun) and moist, rich humus soil. Dry soil will tend to slow the plants growth, so water should be provided during dry periods. In the coldest areas of the country, if your Bergenias are growing in full sun, they should be covered lightly with mulch, to prevent burn. You should also provide protection by planting a shrub or placing a boulder as a wind block if you live in an area prone to strong, cold winter winds. Bergenia clumps that have died out in the center will need dividing. The best time to divide Bergenias is in the spring, after they have finished blooming. Usually after three or four years, the plant will become overcrowded and the flowering will begin to decline. New plants can be started by digging and dividing these old clumps. Basal leaf cuttings can be taken from the crown of Bergenia plants in the spring. Bergenia seeds can be sown directly into the garden in late fall or early spring, or you can sow seeds indoors in early spring. Indoors, maintain a temperature in the growing medium of 55° until germination, which takes 15-20 days.